In this postmodern age, people don't want to suffer at all and they "succeed" by avoiding any and all suffering. This includes suffering for evil doing. The feel entitled not to suffer for evil doing. You could see how postmodern that is. There can't be evil doing in a post modern world, except for bringing suffering to an evil-doer. Just telling one of them they're wrong is evil doing, which is in social media world, "not like." When postmoderns do wrong, they don't want to hear it, and if they do, they have suffered. Even if parents are the ones telling them, they are the real evil doers. That's the only rule in their postmodern world. Do you know the verse for that? 1 Peter 2:20, For what glory is it, if, when ye be buffeted for your faults, ye shall take it patiently? but if, when ye do well, and suffer for it, ye take it patiently, this is acceptable with God. 1 Peter 3:13-14, 16-17, 13 And who is he that will harm you, if ye be followers of that which is good? 14 But and if ye suffer for righteousness' sake, happy are ye: and be not afraid of their terror, neither be troubled; 16 Having a good conscience; that, whereas they speak evil of you, as of evildoers, they may be ashamed that falsely accuse your good conversation in Christ. 17 For it is better, if the will of God be so, that ye suffer for well doing, than for evil doing. 1 Peter 4:12-16, 12 Beloved, think it not strange concerning the fiery trial which is to try you, as though some strange thing happened unto you: 13 But rejoice, inasmuch as ye are partakers of Christ's sufferings; that, when his glory shall be revealed, ye may be glad also with exceeding joy. 14 If ye be reproached for the name of Christ, happy are ye; for the spirit of glory and of God resteth upon you: on their part he is evil spoken of, but on your part he is glorified. 15 But let none of you suffer as a murderer, or as a thief, or as an evildoer, or as a busybody in other men's matters. 16 Yet if any man suffer as a Christian, let him not be ashamed; but let him glorify God on this behalf. No one should be surprised when he suffers as an evil doer. Throughout scripture, one repeated aspect of repentance for evil doing is admittance of the deserving of the punishment, essentially of taking the punishment. A person who is angry with punishment, that he deserves, is not repentant. This is a major theme of the book of Lamentations. God will most often show mercy to unrepentant sin. He gave multiple opportunities to Israel. The punishment is the barbaric siege of Jerusalem that God brings as a means of chastisement. It is savage treatment by the Babylonians. Here are some excerpts a samples (bold again for emphasis). Lamentations 1:5, 8, 15, 18, 5 Her adversaries are the chief, her enemies prosper; for the LORD hath afflicted her for the multitude of her transgressions: her children are gone into captivity before the enemy. 8 Jerusalem hath grievously sinned; therefore she is removed: all that honoured her despise her, because they have seen her nakedness: yea, she sigheth, and turneth backward. 15 The Lord hath trodden under foot all my mighty men in the midst of me: he hath called an assembly against me to crush my young men: the Lord hath trodden the virgin, the daughter of Judah, as in a winepress. 18 The LORD is righteous; for I have rebelled against his commandment. Lamentations 2:4, 17, 4 He hath bent his bow like an enemy: he stood with his right hand as an adversary, and slew all that were pleasant to the eye in the tabernacle of the daughter of Zion: he poured out his fury like fire. 17 The LORD hath done that which he had devised; he hath fulfilled his word that he had commanded in the days of old: he hath thrown down, and hath not pitied: and he hath caused thine enemy to rejoice over thee, he hath set up the horn of thine adversaries. Lamentations 3:1, 26-30, 33-43 1 I am the man that hath seen affliction by the rod of his wrath. 26 It is good that a man should both hope and quietly wait for the salvation of the LORD. 27 It is good for a man that he bear the yoke in his youth. 28 He sitteth alone and keepeth silence, because he hath borne it upon him. 29 He putteth his mouth in the dust; if so be there may be hope. 30 He giveth his cheek to him that smiteth him: he is filled full with reproach. 33 For he doth not afflict willingly nor grieve the children of men. 34 To crush under his feet all the prisoners of the earth, 35 To turn aside the right of a man before the face of the most High, 36 To subvert a man in his cause, the Lord approveth not. 37 Who is he that saith, and it cometh to pass, when the Lord commandeth it not? 38 Out of the mouth of the most High proceedeth not evil and good? 39 Wherefore doth a living man complain, a man for the punishment of his sins? 40 Let us search and try our ways, and turn again to the LORD. 41 Let us lift up our heart with our hands unto God in the heavens. 42 We have transgressed and have rebelled: thou hast not pardoned. 43 Thou hast covered with anger, and persecuted us: thou hast slain, thou hast not pitied. Lamentations 4:6, 13, 22, 6 For the punishment of the iniquity of the daughter of my people is greater than the punishment of the sin of Sodom, that was overthrown as in a moment, and no hands stayed on her. 13 For the sins of her prophets, and the iniquities of her priests, that have shed the blood of the just in the midst of her, 22 The punishment of thine iniquity is accomplished, O daughter of Zion; he will no more carry thee away into captivity: he will visit thine iniquity, O daughter of Edom; he will discover thy sins. Lamentations 5:15-17, 15 The joy of our heart is ceased; our dance is turned into mourning. 16 The crown is fallen from our head: woe unto us, that we have sinned! 17 For this our heart is faint; for these things our eyes are dim. Especially look at Lamentations 3, the apex of the book, where Jeremiah writes that this punishment from God is His faithfulness, great is His faithfulness (3:23). Another facet of what I'm writing about in this essay is the example of the Babylonian captivity of Judah. Judah went through a siege, but then captivity and part of her repentance before God was accepting the punishment she received. People who can't take their punishment are not repentant. One should also consider the repentance of Zacchaeus in Luke 19. Part of his repentance was retribution or remuneration, which was punitive. He had to pay back with a high percentage of interest money that he admitted that he stole through wicked taxation. Jeremiah the prophet, since he cannot persuade people to submit to God’s precept, and so to prevent the destruction of their country by the king of Babylon, is here persuading them to submit to God’s providence, by yielding tamely to the king of Babylon, and becoming tributaries to him, which was the wisest course they could now take, and would be a mitigation of the calamity, and prevent the laying of their country waste by fire and sword; the sacrificing of their liberties would be the saving of their lives. I. He gives this counsel, in God’s name, to the kings of the neighbouring nations, that they might make the best of bad, assuring them that there was no remedy, but they must serve the king of Babylon; and yet in time there should be relief, for his dominion should last but 70 years (v. 1-11). II. He gives this counsel to Zedekiah king of Judah particularly (v. 12-15) and to the priests and people, assuring them that the king of Babylon should still proceed against them till things were brought to the last extremity, and a patient submission would be the only way to mitigate the calamity and make it easy (v. 16-22). 8 And it shall come to pass, that the nation and kingdom which will not serve the same Nebuchadnezzar the king of Babylon, and that will not put their neck under the yoke of the king of Babylon, that nation will I punish, saith the LORD, with the sword, and with the famine, and with the pestilence, until I have consumed them by his hand. 9 Therefore hearken not ye to your prophets, nor to your diviners, nor to your dreamers, nor to your enchanters, nor to your sorcerers, which speak unto you, saying, Ye shall not serve the king of Babylon: 10 For they prophesy a lie unto you, to remove you far from your land; and that I should drive you out, and ye should perish. 11 But the nations that bring their neck under the yoke of the king of Babylon, and serve him, those will I let remain still in their own land, saith the LORD; and they shall till it, and dwell therein. It was God's will that His people submit to His judgment because of their sins. Their admission of guilt and willingly acquiescing to His punishment would mean repentance. This is a reason that parents should look for willing acceptance of discipline from their children. Later on, if a child, who has sinned, is bitter because he chafes under the punishment he received, essentially in willful pride, he is not repentant. Someone suffers in actuality for well-doing. Someone is punished or chastised for evil-doing. When a parent spanks a child, lectures a child, disapproves of a child's behavior, the child isn't suffering. He's being punished and deserves it. If he wants to hold on to that and consider himself to be a victim, this is a recipe for disaster. I don't even believe it. Children who do that are looking for a way to justify future sinning. All discontent and resentment holds a future of iniquity. If a church member is subjected to discipline and the church practices separation from that person, and he doesn't not accept that punishment, then he is not repentant over his sin. He is justifying his own actions. If he is saved, I would expect chastisement, even death, and that would be a mercy of God. If this is an unbeliever, and he doesn't repent, it is even worse punishment in store for his future. In 1975, Jakob Van Bruggen (Wikipedia link), longtime professor of New Testament at the Theological College of the Reformed Churches in the Netherlands, gave a lecture on the text of the New Testament in Broederwig, Kampen at the anniversary of the College. The transcript of the lecture was translated into English and was published into a forty page booklet entitled, The Ancient Text of the New Testament. With his lecture, Van Bruggen argued for the superiority of the majority text and the textus receptus (those two are not seen as the same thing anymore, but at one time, the textus receptus would be referred to as the majority text -- for the sake of the reader, very often the terms textus receptus, received, Church, ecclesiastical, Syrian, Byzantine, traditional, and majority are used interchangeably). I want to explain his lecture in a manner that almost anyone reading could understand his argument. It is very good. When I consider the text of scripture and its preservation, I start with scriptural presuppositions about what we should expect God to have preserved and to have made or kept available. This is the best approach or even the right one, but it is also important, I believe, to accompany that with an explanation of the text in a historical manner. Van Bruggen has thought through and given a good defense in a textual way, and it should be considered. It is strong. All this does not yet mean that there is certainty about the correct text of the New Testament. Agreement can be based on mutual certainty, but also on mutual uncertainty. And the latter is the case. This again means acquiescence in a consensus text which has been determined on the basis of uncertainty. . . . many readings which have been chosen only by the majority of the committee. That they did not unanimously arrive at a text. . . . At present there is no certainty concerning the history of the textual tradition. . . . the eclectic method is generally followed. . . . Subjectivity is not out of the question with this method. Thus they will just have to arrive at a text by majority vote. Among all uncertainties of the 20th century, we, however, to one great, lasting uncertainty in the modern textual criticism. . . . One can even say that the modern textual criticism of the New Testament is based on one fundamental conviction that the true New Testament text is at least not found in the great majority of the manuscripts. The text which the Greek church has read for 1000 years, and which the churches of the Reformation have followed for centuries in their Bible translations, is now regarded as defective and deficient. . . . Already for more than 100 years the certainty that this type of text is inferior has already been taken for granted. . . . The heritage of the 19th century criticism was a solitary certainty -- the inferiority of this "traditional text." . . . . It is striking how emotionally people often speak about this one certainty. Van Bruggen does not explain why one should even expect certainty for the text of the New Testament. This is a single lecture that doesn't come close to asserting everything, so he just assumes the expectation of certainty. The nature of God and His Word assumes certainty. Uncertainty is not a satisfactory basis for faith. It should be easy to understand why certainty is important. Scripture itself affirms certainty to the jot and tittle, every word, settled to the extent that a curse exists on those who add or take away from the words (Rev 22:18-19). I often hear evangelicals today mock the expectation, approaching certainty like of course it isn't to be expected. This exposes their absence of biblical presuppositions. The friction between certainty and uncertainty in modern New Testament textual criticism gives occasion to ask what reasons are given for rejecting the Byzantine or Church text, which has been used for many centuries. . . . There is a scientific and religious duty to ask the question whether the ancient text of the New Testament is not found in the majority of the manuscripts and whether the church has failed to follow the truly ancient text for many centuries. this text can on internal grounds be characterized as secondary because of its inclusive nature (conflate readings) and because of its tendency to harmonize and assimilate, leading to a complete and lucid text. Soon thereafter Van Bruggen provides a snapshot push-back: [I]t must be remembered that for centuries people could daily acquaint themselves with the character of the Byzantine text or the textus receptus, yet they did not regard this as secondary and inferior." Also, "if Hort's arguments are proven right, then it is strange that they were not advanced earlier. If they are wrong, the question becomes urgent why they were still generally accepted in the last century." Although puzzled by that phenomenon Van Bruggen chooses to focus his "attention on the question what force the argument of Hort in themselves have" -- "after all, on the ground of these arguments people were so bold to abandon the traditional text." The next three sections of the booklet are given to dealing in order with each of Hort's arguments. Van Bruggen earlier made light of the use of a majority of committee members to determine the acceptance of a textual variant. He asks, why since there is no certainty still about the text of the New Testament would the critics not then rely on a majority of the manuscripts? The answer is Hort's first argument, that the majority can be traced back to one recension, that is, "the many manuscripts would be nothing else than copies of only one manuscript." The critical text is not based on a majority of the manuscripts because those are given the weight by critics of only one single manuscript. "The historical starting point for this recension-idea is sought in the person of Lucianus of Antioch." The critics are saying that a man, Lucianus of Antioch, revised the New Testament text in the fourth century and then the majority of the copies of the New Testament were made from that 'corrupt' revision. The majority of the handwritten copies, manuscripts, of the New Testament must be dismissed, critics say, because they all come from the same source, which can't be trusted. These are the copies which give the essential basis of the textus receptus and the Reformation era translations of scripture. That there is much agreement between all these manuscripts does not mean that they all come from one and the same source. [They clearly show] that it is better to describe the Byzantine textual tradition as a collection of converging textual traditions than as a varying reproduction of one archetype. This fact now prevents us from thinking of one recension as the source for the text that is found in the majority of the manuscripts. No matter how one judges about the value of the growing consensus in the textual tradition, one can not simply reduce the large majority of manuscripts to one vote and then only a secondary vote. . . . It is impossible to treat the majority of the manuscripts during the evaluation of them as though they textually formed one family. . . . We do not deny that small family groups can be distinguished within this majority, just as families can also be determined in other text-types and with the versions. That no importance is attached to this majority as such in modern textual criticism is not only connected with the recension-idea, but especially with the opinion one has concerning the age and character of the Byzantinue type. The different centres of production in the 4th and following centuries aimed at a most faithful copy of the original or at a good restoration of the original text. . . . Growing uniformity . . . points in the direction of a simultaneous turning-back in various centres to the same same central point of the original text. This text was sought in the oldest and most faithful manuscripts. Churches should not have allowed a modernist influenced movement to abandon the text received by the churches. Many leaders did reject the rationalistic bias against the uniformity of a majority of the copies. There was a historic trend toward uncertainty that resulted in this weak theory holding sway. An honest recalculation would reconsider the historic reception of a uniform text in light of the unmasking of the underlying ideology for its abandonment. With April 15, tax day in the USA, having just recently passed, it is appropriate to reflect on the mantra that the rich are not paying their "fair share" of taxes, but are ripping off the poor, who allegedly are overwhelmed by the burdens the federal government is imposing on them to give to the rich. What part do the rich and the poor pay? The top 50% of tax payers paid 97% of all income tax in 2016, and the figures are about the same today. The top one percent paid 37% of all income tax. Approximately 44% of all lower-income workers will pay no income tax at all. In other words, they are not just failing to pay their "fair share." They are paying no share. The rich are paying their fair share--in fact, they are paying far more than their fair share. The government is stealing from the rich. What is a "fair share"? In economics, God teaches that taxation on income should be below a flat 10% rate—any higher rate is a curse and a form of slavery (1 Sam 8:6-8, 15, 17-18). “Redistrib­uting” wealth—the government taking from one person by force through taxation to give to someone else it believes is more worthy—is ungodly (1 Sam 8:14-15). Governments that redistribute wealth are stealing (Ex 20:15), just like a robber who “redistributes” what a person owns. Such practices are considered in Scripture to be pagan (1 Sam 8:19-20), tyrannical (1 Sam 8:17-18), and oppressive (1 Sam 12:3). Devaluing currency—as the government does by inflation—is also stealing (Isa 1:22, 25). National debt is a curse (Deut 28:12, 44). Bribery—including bribing certain classes of people to vote a certain way by promises of government handouts—is a sin and “perverted judgment” (1 Sam 8:3), for the government is to be impartial and neither favor the rich or poor (Deut 16:19; Ex 23:3; Prov 22:16). God commands individual believers and churches to generously and selflessly help the needy and poor (2 Thess 3:10; Gal 6:10; Lu 6:35), and not to do so is sinful, but for the government to employ force to extract money from people to give to either the rich or poor is the sin of stealing, not charity or generosity. The Bible teaches an economic system that values private property (Ex 20:15), free enterprise (Mt 20:2), and economic freedom (Mt 20:15), rather than socialism, fascism, or communism. Biblically, the government is simply to be like a night watchman, punishing evil (Romans 13) and doing nothing except offering praise to what is good, rather than funding what it believes to be good through taxation. 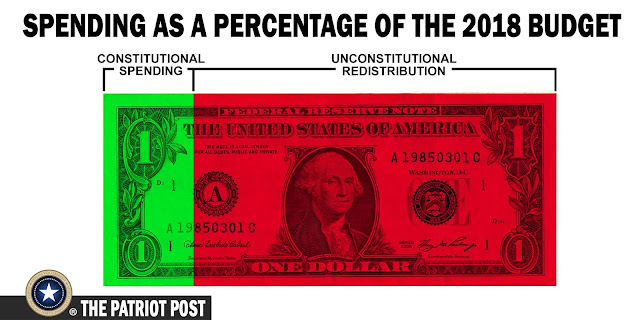 Were the government to cease its sinful "redistribution" or stealing of people's private property through unbiblical spending, it could definitely both tax at below a 10% flat rate and also balance its budget and pay off the national debt. A flat tax is appropriate, not only because of the (entirely sufficient) reason that God says that it is, but also because it is very important for everyone to have "skin in the game." When 44% or so pay no income tax at all, they have no incentive to fight for lower taxes and spending--rather, they have every incentive to vote for politicians who promise to steal more from other people and "redistribute" the goods of others to themselves. Furthermore, a flat tax rate of less than 10% would result in much faster economic growth, making both rich and poor more wealthy. It should be noted that in America the "rich" and the "poor" are highly fluid, not static, categories. It is not that hard to become a millionaire in the USA. (See the IRA calculator here, for example--just start early enough and it is highly likely you will be a millionaire if God spares your life). Furthermore, if you avoid the "strange woman" of Proverbs and work, you have less than a 2% chance of being below the poverty line. What is more, the "poor" of the USA are not really poor--they are far better off than the vast majority of people in the world today, and far better off than just about everybody that lived in past centuries. Far too often (though not always), people are poor because of sinful behavior--drugs, alcohol, sexual immorality, etc.--and government welfare programs actually make their situation worse, not better. Rather than stealing money from the wealthy through unjust taxation, the government should praise the wealthy who give generously to true churches that preach the gospel that changes the lives of drug addicts and other sinful lifestyles and cleans them up. From a secular viewpoint, an organization such as Kiva does far more to help the poor in the USA and around the world with the money it has than the government does with the funds that flow through its "redistribution" schemes. In conclusion, the rich are indeed not paying their "fair share"; they are paying much, much more than their fair share. The poor, by contrast, are not paying their "fair share"; a huge percentage of them are paying no share at all. These facts are ungodly, like many of the other things that the government does, the worst of all being allowing the slaughter of helpless infants in the womb. Politicians will never say what this blog post says, because it would be highly unpopular and they would be out of a job the next election cycle. (To be even more politically incorrect, you should not give the homeless money either--they are almost certain to spend it on drugs or alcohol, not food.) Visualize the soundbites and headlines now: "Politician says to tax the poor and give nothing to the homeless," followed by pictures of needy people, while ignoring the fact that the role of government, not of private charity, is under discussion. It is not the role of government to be "generous" with other people's money--it is the duty of individuals and churches to be generous with their own money. While politicians will never say these things, they are, nevertheless, the truth. 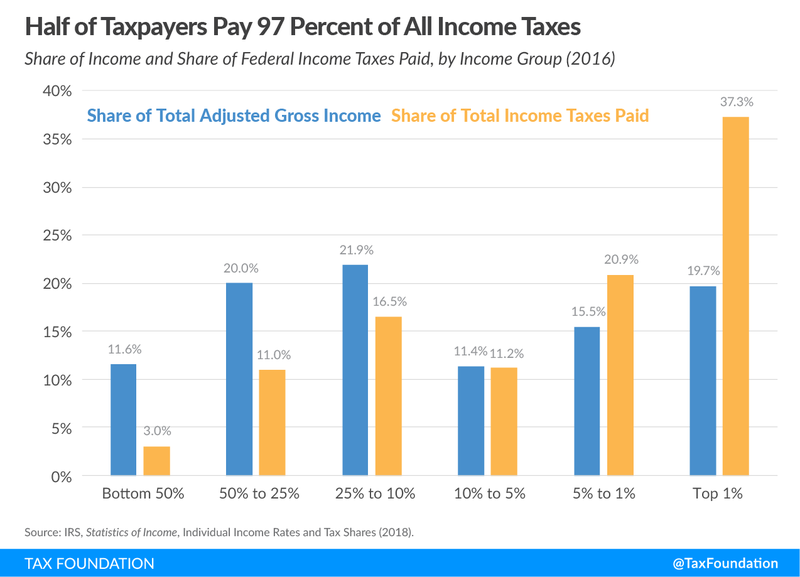 The rich are paying too much in taxes, and the poor are not paying their fair share. The government is wickedly violating the eighth commandment, "Thou shalt not steal" (Exodus 20:15), and God's sword of justice will not always sleep. God requires no schism in the body. We know that schisms are caused by violations of scripture, so those are what need to be resolved. We also know that issues of liberty are not to cause schisms (Romans 14, 1 Corinthians 6-10), even if they still might. Both scriptural issues and non-scriptural ones must be dealt with for reconciliation to occur. I know that the non-scriptural issues are sometimes the bigger for people than scriptural ones. They are also very often more difficult. However, they also must be recognized to be non-scriptural issues, even though they are harder. At my age and for the number of years as pastor of a church, I have seen many convinced of a wrong that did not exist. Someone was offended, but no scripture was violated. Very often it is an offense of conventional wisdom or a societal norm. A true mediator would inform of the non-biblical nature of the offense, and the one offended might at that juncture desire a different mediator. The Apostle Paul was judged and condemned many a time on ginned up charges. Someone with hurt feelings still could expect punishment exacted for perceived violations. When it comes to determine whether an offense has occurred, what the offense is, and how it will be reconciled, the severed parties must come to an understanding of whether it is a scriptural offense. Even if it is a non-scriptural offense, the two parties will need to agree on how to proceed forward with unity. Some of the biggest breaches in marriage are non-scriptural. The wrong reaction to one of these sometimes is the violation. It doesn't mean that the non-scriptural scruple isn't an obstacle. In 1 Corinthians 13, Paul said that love "seeketh not her own." If something bothers someone else that is non-scriptural, love can give it up, as long as giving it up isn't a transgression of a biblical teaching. There isn't a verse that prohibits chewing gum. Nothing in the Bible says that someone can't chew gum with his mouth open, snapping it and popping it. Things like this -- and I mean, like this -- can really bother a party. The major problem isn't the so-called "gum snapping" here, but the unwillingness to give it up, when it isn't required to "snap gum" either (and again, I'm using it as an example). If a non-scriptural issue can't be resolved, the inability to resolve often is the trouble. Someone might be sinning and causing disunity. Someone is not endeavoring to keep the unity of the Spirit. For a resolution, terms will likely need to be set and someone else might need to come in and mediate the situation. Unity is based on what scripture says. If it doesn't say anything, unity itself must be bigger than something scripture doesn't say, because the Bible does require unity. Very often dissension is caused by something a mere preference. Outside of a church, the terms of reconciliation are still scriptural. Two parties must align upon scripture. Actual reconciliation will not defy scripture. Reconciliation will fail if one side or both will not acquiesce to God's Word. If one side will and the other will not, the latter is the one causing the division. If one side won't even have the Bible opened as a means of judgment, that side is not interested in reconciliation. Scripture shows that often two sides can't get along because one of them doesn't want to give up its sin. It doesn't want to be judged by a mediator, because that might mean giving up sin. That's a side that wants acceptance and approval, but not a relationship as God defines it. The relationship of God is walking in the light as he is in the light. As we work our way through the Bible about relationship, it is the story of transgressing the Word of God. The pursuit of reconciliation confronts the offense. Instruction might be necessary. The offending party may not want to repent. That is the cause of the division. Maybe the one offended might not want to forgive the offender. That can happen too, but either way, someone sinned or someone thinks someone has sinned against him. An attempt at reconciliation that might include mediation if necessary is not the failing of a relationship. The unwillingness to reconcile and to receive mediation is the failing. If someone wants a relationship, he will want the biblical means of obtaining it or preserving it. If someone doesn't want to be judged at all, he is not going to achieve reconciliation. I would call that party stubborn, rebellious, or proud or something like those. Those aren't biblical, Christian qualities. Relationship could be said to be the theme of the Bible. It could be argued. It could easily be demonstrated that certain books of the Bible are primarily about relationship. One of those I would contend is an important New Testament epistle, Ephesians. Chunks of other books, sometime large portions, are about relationship. I think Ephesians is all about relationship. I believe the main concern of Paul in the book is the relationship in the church at Ephesus, but that is dependent upon the relationship with God. It's about both God and the Ephesians but the point is unity between church members. Relationship is the chief concern of Ephesians. This fits with what we Jesus informs of Christianity in His upper room discourse and then prayer to His Father (John 14-17). Anybody who really cares about relationship will consider it within these contexts. The problem with each other starts with a problem with God, the alleviation of which is the source for right relationship with each other. In other words, the problem between men starts with a problem with God, the solution of the latter is the basis for the solution of the former. The epistle reads as though the purpose of the teaching on relationship with God is toward the right relationship with each other in the church. Right relationship is modeled in the church and an example of what God intended between He and men and between men with men. Paul highlights the conflict in relationship between Jews and Gentiles beginning in Ephesians 2:11. The conflict between men and men mirrors the conflict between men and God, which Paul describes as being dead to God because of at least six different reasons, all ameliorated by the power of Christ's resurrection: sin and trespasses, worldliness, Satan, disobedience, lust, and wrath. This is all very objective, concrete basis for a barrier in relationship between God and man. The same causes the rift between men and men -- real, true reasons, not just impressions or feelings. Before Paul moves to the disunion between people, he establishes the foundational cause of that division seen in what keeps people away from God. These are the real reasons, not the phony ones that people will use that are extricated by psychobabble or someone's own interests. When I evaluate my relationship with other people, the base reasons in Ephesians 2:1-3 represent the same ones that separate me from people. The first one is sin or trespasses, so actual sinning (v. 1). The second is walking after "the course of this world" (v. 2), and I want to park there for a moment. I can't coexist with worldly people, people who are so immersed in worldly things, even if not in and of themselves sinful. People that are constantly in tune with all things popular in the world, the hashtags, the media, orchestrated by what comes next in Ephesians 2, "the prince of the power of the air" or "the spirit that now worketh" (v. 2). Satan keeps his people distracted with things that don't go the way of obedience to God, or in other words toward "disobedience," also in v. 2, "the children of disobedience." Disobedience is not sin or trespass, but not doing what God wants them to do. They don't talk about God, the Bible, salvation, the gospel, spiritual things, and if they do, they are very veiled in the way they do it so as not to disassociate with the world. There are fads, activities, and philosophies in the world, the ways of the world, that keep people in association with the world. Those ways run incongruent to someone who is in the light, is heavenly, and alive to God. I want to use purposefully what will be considered to be a less plain example. There are much clearer ones than this, that I'll also mention those. A boy or man wears his baseball cap backwards all the time. It's not something I even bring up to people, but I just saw someone mock fathers who say something about this to their sons. There's nothing wrong with wearing a baseball cap backwards. The catcher does that so he can wear the catcher's mask. But the cap was designed for the bill of the cap in front. I also find an affront the stiff-billed hip-hop cap. Not me, but quora displays knowledge when it asserts, "Most people who wear their caps backwards are trying to look cool." The father who simplifies things by saying the backwards cap is rebellion is just saying that it runs counter to design or it signals someone functioning against natural law. Now it looks like someone attempting to compensate because of some lack, perhaps lack in confidence, that he should be getting through Jesus Christ. Fathers could, instead of dealing with this symptom, look to help with the underlying cause -- why is he so eager to fit with the course of this world system? The course of this world is most seen in entertainment, music, and recreation, those who fill their lives up with lust and pleasure, lust which is mentioned in v. 3, "Among whom also we all had our conversation in times past in the lusts of our flesh, fulfilling the desires of the flesh and of the mind." Booze, rock music, dancing, partying, and regular talk about smutty television mark this person. This breaks my relationship with this person, but it also is what is severing his relationship with God. The former again proceeds from the latter. Godliness, interest in heavenly things, a resurrected type behavior, what Paul calls, seeking those things which are above (Colossians 3:1) are the regular way of a true believer, providing some basis of genuine relationship. Having to attempt to figure out the latest fad or approve of temporal things to show acceptance or toleration is not a biblical relationship, so it isn't relationship. It is a capitulation to anything or everything. We can't serve God and mammon. A choice must be made, and those "relationships" must be left aside. From what I've read and heard, almost every generation of older people think things are worse now than before. It's almost a rite of passage into old age to complain about what young people are doing now, comparing it to the way things were done. This expectation of each succeeding generation of old people is so anticipated that it might be assumed that things aren't actually worse, it's just the familiar protestations of the next crop of spinsters. The postulation becomes, "don't trust the notions of the aged." Except. Things really are much worse now. Take that from someone who still hasn't started ordering off the senior menu, even though in spirit a card-carrying old-timer. Without any curmudgeon bias, this constitutes measurable figures suggesting things really are worse than they were. "None" is different at least, and estimable bad news whether expressed by creaky oldsters or not. Maybe they do know what they're talking about. The Apostle Paul, who was probably younger than me when he wrote this, commended the Thessalonian church "because that your faith groweth exceedingly, and the charity of every one of you all toward each other aboundeth" (2 Thessalonians 1:3). By key quantifiers, a church had gotten better than what it was, which someone might call a rarity. It can happen, but it usually doesn't. Overall today, churches have gotten worse all over, even though sometimes publicizing that they are doing better than ever. If faith isn't growing and love abounding, then that would be a way of saying that things are worse than before and that something is wrong. One should want increased faith and love as a computation of improvement. Albom in his article says that it makes sense that "nones" are multiplying in light of (or maybe darkness) a provided sample list of what's gone wrong with religion. One might ask Albom, however, is this a cause or an effect? Did things happen because of this list or is this list many of the things happening? I choose the latter. I choose, these are some of the symptoms and not the disease, and this is something I've been writing about ever since I started writing here. Albom argues for religion. He ends his column with this question: "Is it God that you are disillusioned with, or man?" It's a good question, which should bring other ones. If someone can judge religion or at least "organized religion" to be bad, then he himself must have some objective standard of judgment by which he assesses it. At the very beginning of the church, which was founded by Jesus Christ, God put to death two members of the first and only church in Jerusalem because of hypocrisy. Hypocrisy can only exist where something true and real exists. What is true? Or, what is truth? I'll assume that you know the last question is the name of and always has been the identity of this blog. What is truth? An increase in faith is a stronger belief in the truth. I see faith waning and weakening because of attacks on and then uncertainty in the truth. As bad as it is out there, in my lifetime there has never been a better basis for believing. We don't have any new scripture, but so much today validates what we already know from the Bible. Nothing in science or archaeology or history contradicts what God's Word teaches. Some of the best arguments from scripture have been formulated and are easily available. Sound exposition of the Word of God is available to a wider audience. And yet it is also true that things are much worse. What is happening? It seems that even solid, faithful families have lost some children to the world. The "nones" are some of those pushing the eject button. I propose two major reasons for things being much worse today. They are both scriptural. One that I'm not going to suggest as a reason is the prophecy from the Bible that things will get worse before they can get better. We might be in the midst of that, but there are still reasons why things get worse, and I don't think they'll be much of a surprise. First, the world is a harder place than ever to keep the faith. The world is a more deceptive place. It's hard to keep your children away from the world. You can't do what Mark Twain apparently suggested and put them in a barrel and then at some point put a hole in it. Churches are less separate than ever and yet the world is worse than ever -- that is a lethal combination. Everyone today has the easiest access to the worst possible materials. It makes truth easier to spread, but it's just as easy to disperse error of all kinds. Most dangerous in my estimation, but matching what I see in scripture, is lust. Television, internet, radio, mobile electronic devices, social media, and travel broadcast the most alluring, destructive information and pictures at light speed. It seems impossible to stop. I'm not saying that we can't, but it is very difficult. Peter wrote that "fleshly lusts war against the soul" (1 Peter 2:11). Sadly, churches use fleshly lust as a part of the church growth movement. I think most churches today then propagate a counterfeit grace of God that validates the fleshly lust. Young people feel entitled to belly up to the trough of this world with full forgiveness and acceptance. Churches actually provide it and those are counted often as spiritual because of their use of mysticism. This also redefines God in people's minds. So, the world provides lust and churches provide lust. It's everywhere. The world itself is better and faster at it. Young people are deceived all over. Parents try to step in, and they just don't think the parents get it. They've been introduced to and offered something that they just don't think the previous generation understands. They don't want to give it up. However, it isn't God. It is a placebo that will send almost all of them careening into Hell forever. Second, closely related to one, churches stopped being about the truth. If the truth is why people are in the church, then it is also what will keep them in church. They are leaving, because it has become about something else. Even if people have offended the young people, who are now becoming "nones" and think justifiably so, it doesn't change the truth. Is the offense, based on the truth or not? There's got to be some basis for the offense, those kinds of things Albom has listed, if it is offensive, unless it is only about self. Our church hasn't lost much through decades now, because it has been based upon the truth. If a young person goes elsewhere, and it becomes apparent through other churches that lust and the truth can coexist, that has become a problem. They've never been exposed to the false version of Christianity either adopted by extended family members or around new places of employment. They didn't know you could be a Christian and worldly or a Christian and pagan. They saw something where someone could be both because of a perverted view of forgiveness, love, grace, and sanctification. When someone becomes a "none," he was never saved in the first place, but something still took him over to apostasy, where he deserted the truth, like a Judas or a prodigal. Peter compares it (2 Peter 2) to a dog returning to its vomit. A very influential false version of Christianity tangles people and then finally bounces them into the world Those religious institutionas won't last. Before my life ends many, if not most, of them will be gone, completely turned away from the faith. They are not based upon the truth. Almost every church in America has degraded. I can't usually find a place to attend when I'm on the road. There is either something wrong in the preaching or the worship. I've described the process in previous posts. If they don't think God's Word is inspired, then it wasn't preserved, and then they aren't sure what it means. Capitulation in any of these areas is a death knell. At the same time, the churches become about something else about the church that is attractive to people to try to keep who they've got. None of that is right. Neither will it work.